Because who doesn't love some beautiful bay windows? Do you dream of lying in bed in the morning, opening the curtains and basking in the sunshine? If so, then today could be your lucky day. You won't be able to get enough of these huge bay windows. Overlooking the street, they let in tonnes of natural light. This space is open and airy, and you'll never feel cooped up. We think this studio is great for a couple looking for cosy town living. Out of the city hustle, you'll find the beautiful Acton Park, and a great little collection of local shops. The bay windows let in plenty of natural light and make this a super sunny studio. This space is modern and clean, with beautiful hardwood floors. The neighbourhood is quiet, but has everything in convenient walking distance. The kitchen is fully equipped, but doesn't offer an oven or dishwasher. Aspiring chefs, this isn't the spot for you. “I loved this property. 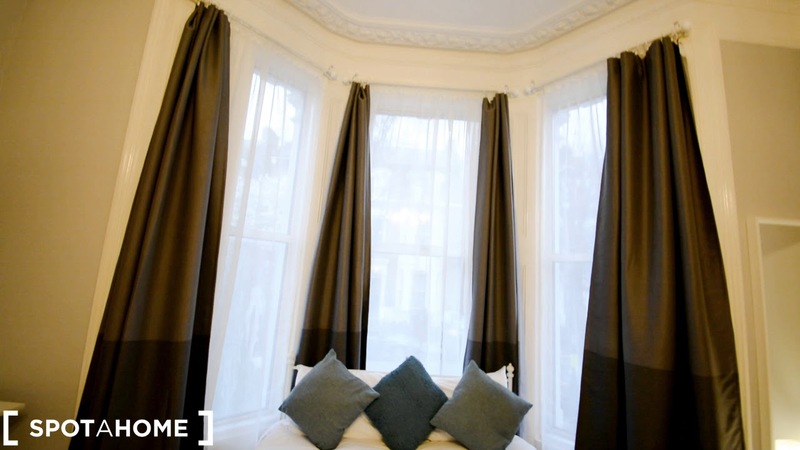 It has beautiful bay windows, perfect for enjoying the sunshine in the mornings." This is a beautiful ground floor, studio apartment on Burlington Gardens, London. Enjoy all the natural light you could ever want with huge bay windows. Plus, beautiful hardwood floors throughout. We think this studio is ideal for a couple looking for a little peace and quiet. You're well connected by train, and you've got all the charm of a quiet town. There's plenty of parks, plus all the local shops you need. Soaking up sunshine in the morning — there's no better alarm than the morning sun. Inviting friends around for drinks — they'll be sure to love the charm of your new place. Exploring the neighbourhood — stroll through Acton Park, then visit your favourite café for a coffee. This studio offers a washing machine, but no dryer. It might be time to invest in a clothes rack.